Official ICD-10-CM 2019 code book provides the complete code set for diagnostic coding. All 21 chapters have been organized to provide quick and simple navigation of the text in order to facilitate accurate diagnostic coding. 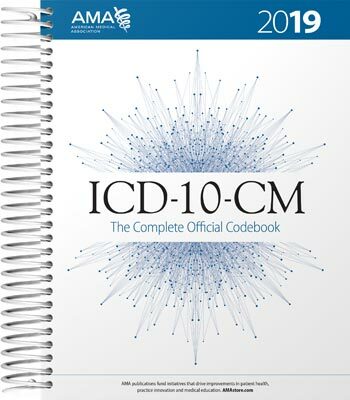 The complete official code book ICD-10-CM 2019. This 2019 ICD-10-CM edition is guaranteed to arrive with the official 2019 guidelines bound in the code book. Preferred choice for those taking certification exams. ICD-10-CM 2019: The Complete Official Code Book provides the entire updated code set for diagnostic coding, organized to make the challenge of accurate coding easier. This code book is the cornerstone for establishing medical necessity, determining coverage and ensuring appropriate reimbursement.